Mother’s Day will always have a special meaning to me. Not only because it’s the day we celebrate and cherish our mamas, but also because Romeo was born on Mother’s Day last year and made me a mommy for the first time. It’s a little funny I’m celebrating Mother’s Day for the second time even though Romeo is a few weeks shy of being one year old. I made a Mother’s Day Gift Guide last year and my sweet and loving husband bought me a few items off that board! Of course I had to create another one this year… hint hint. I picked a few of my top items that I think most moms would like regardless of age. Hope you’re inspired and get a few ideas for your mama! Ginger Syrup from Morris Kitchen for easy cocktails. Studiomake Flawed series cups. Designed to bring attention to the beauty of flaws. Available at Gretel Home. 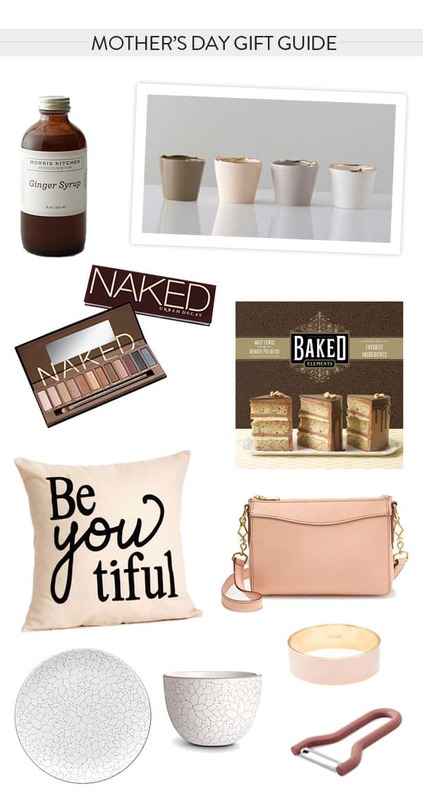 My mom and mother-in-law are always asking me for make-up tips or to help find them the best eye shadow, so added the Naked pallet by Urban Decay to my gift guide this year. I’ll post more about why we love it tomorrow! Never too young or too old to bake something sweet. Baked is one delicious book! I own it and it’s one of my favorites. Be-you-tiful at every age. Mom will love waking up to this sweet pillow every morning. The ultimate, classic Jcrew purse in a subtle rose color. Perfect for day to day use and suitable for any age! The most beautiful bowl and plate inspired by the Alabama state flower. I’m obsessed with this dinnerware!! This simple Jcrew bangle is the perfect accessory for mom and they come in several colors. If your mom likes to cook, this is the coolest peeler I’ve ever seen. Clean and simple… I love it! I love all your pics Eden!! I’m excited to hear what you have to say about the naked pallet, I’ve heard great things about both of them! I’m just always hesitant with buying pallets because I never use all of them. But if you think it’s good then maybe ill give it a try! 🙂 and that dinnerware is gorgeous!!! !